Bear Market - What Does It Mean? 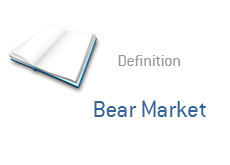 There is no single definition of a "bear market" that is accepted by everyone. A bear market means different things to different people. The "standard" definition that is used by most is that a bear market comes when multiple major indexes drop by at least 20% over a minimum of two months. In a "correction", major indexes would drop substantially over a shorter period of time. A bear market is more of a prolonged slump that is marked by "bear market rallies" and steady doses of bad market news. A bear market is marked by investor apathy and a steady decline in major market indexes. A correction, on the other hand, is a smaller decline that comes over a shorter period of time in an asset or index that is in an uptrend. Example: 2008. 2008 is the perfect example of a "bear market". A long, prolonged decline in all of the major market indexes (DJIA, Nasdaq, S&P 500). Incredible investor apathy that has led many to exit the markets altogether. Shrinking corporate earnings. A steady drumbeat of bad news for the markets. Major declines in all of the major indexes (at least 30%+) with many investors openly wondering when things will ever turn around.